Adapting in the Dust is a vital evaluation of how well Canada’s institutions, parties, and policy makers responded to the need to oversee and sustain a military intervention overseas, and an important guide to what will have to change in order to do better next time. David Auerswald and I explain why countries have so much trouble when trying to cooperate in multilateral military efforts. We introduce the topic via a variety of vignettes that illustrate the enduring problem of how to fight together in alliances and coalitions. We then examine both the reality of how NATO operates and the theory of cooperative military efforts to assess the primacy of national capitals, which often makes it feel as if each country is fighting their own war. We develop an institutional approach that focuses on how democracies make decisions as they manage their troops abroad--collectively via coalition governments or individually by Presidents and Prime Ministers. This distinction greatly shapes the styles of management. We then contrast the performances in Afghanistan by Presidential systems (US, France) with parliamentary systems led by single parties (UK, Canada) and those led by coalitions (Germany, the Netherlands, Denmark). We move on to discuss two non-NATO members (Australia and New Zealand) before discussing how things played out near and over Libya. We conclude with some of the lessons we learned that will be useful for both policy-makers and academics as we ponder the next multilateral military intervention. Countries that are vulnerable to ethnic conflict may still take sides and support separatists elsewhere. Politicians will push their countries to support whichever side their constituents share ethnic ties. In it, I compare the international relations of the Congo Crisis of 1960-1963, the Nigerian Civil War, and Yugoslavia’s Disintegration, as well as presenting some quantitative work. My second book, this one with R. William Ayres, sought to explain why there was both more and less irredentism in the aftermath of Communism than we might have expected: Greater Armenia, Greater Croatia, Greater Serbia but not Greater Hungary, Greater Romania, and Greater Russia. We argued that nationalism is more complex than usually averred (more so than I present in the first book). That nationalists may compete with other not only over being more or less nationalist but what the nationalism really means, who is really the us and who is the them and how tolerant we are of the them. We argue that xenophobia may serve as a brake on aggressive nationalism as the antipathy to including many more of them may outweigh the ties to the kin who might want to be unified with the homeland. In the course of the book, we argue that conditionality--the standards for membership to the European Union and NATO--was not nearly as powerful as others have argued. A paperback edition is now out with a new introduction addressing changes since the book came out in 2008--especially Russia's recent irredentism towards Crimea. 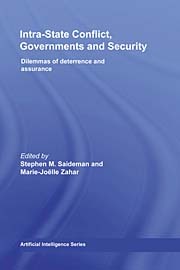 My third book, co-edited with Marie-Joelle Zahar, brought together a smart bunch of folks to consider what security means in the contest of intra-state conflict. What we found was that every government must engage in a balancing act: to be sufficiently powerful to deter or thwart those who might engage in violence while being sufficiently restrained so that the state is not a threat to the citizens. The contributors include: Yasemin Akbaba, David Armstrong, Aysegul Aydin, Christian Davenport, Scott Gates, Patrick James, Stathis Kalyvas, Andre Lecours, Sarah-Myrian Martin-Brule, Mansoob Murshed, Roger Petersen, Donald Rothchild, Paul Staniland, and Zeynep Taydas.